March soybean futures closed at USD9.13 ½, down ½ cents, March soymeal futures were at USD271.00, down 0.20 points, March soy oil futures finished at 37.00, down 0.21 points. Analyst asay that the USDA will reduce soybean 09/10 ending stocks from 245 to 219 million bushels when they release their report next week. March corn futures closed at USD3.51 ½, down 2 ½ cents, and May corn futures at USD3.63, down 2 ¼ cents. The USDA will release the February WASDE report and surveyed analysts average estimate for corn ending stocks are 1.748 billion bushels, down slightly from the 1.764 in the January report. Analysts expect the USDA will raise corn production for South America on the upcoming report. March CBOT wheat futures closed at USD4.73 ¼, down 2 ½ cents, March KCBT wheat futures at USD4.84 ½, down 4 cents, and March MGEX wheat futures at USD5.02 ½, up ¾ cent. The average trade guess for next week's USDA S&D report sees 09/10 wheat stocks falling from 976 to 973 million bushels. EU wheat futures closed generally lower Friday with March London feed wheat ending down GBP1.40 at GBP97.45.tonne, and Paris March milling wheat closing EUR0.50 lower at EUR125.00/tonne. There isn't much to get too enthusiastic about, France has managed to win a small 60,000 MT share of an Egyptian 240,000 MT order this week. Germany may have got a slice of a 700,000 MT Iraq buying order, but overall EU wheat seems to remain uncompetitive. The pound and euro were both weak today, but that didn't seem to equate to much in terms of weakness in the grains complex. The USDA are seen reducing 2009/10 wheat ending stocks from 976 to 973 million bushels in Tuesday's report. The overnight grains closed mixed, with soybeans around 3 cents higher, corn down 2-3 cents and wheat down 3-4 cents. Crude oil is a little higher at USD73.62/barrel after taking a trashing and falling almost 5% yesterday. The dollar is fully steady as a few litters return and risk aversion is back on the menu. US non-farm payroll data has disappointed, with a further 20,000 jobs lost in January, contrary to market expectations of an estimated 15,000 jobs being created last month. Despite that though, the Labor (no, I don't know why they spell it like that either) Department did a bit of "creative accounting" and found some jobs that had fallen down the back of a filing cabinet last month. They say that the unemployment rate is now 9.7% from 10% in December. Analysts had been expecting unchanged or maybe a 0.1% increase in unemployment. The euro is taking another pasting on concern over the plight of Greece, and other euro nations having to take some unpleasant medicine. The trade will now start to focus on wheat the USDA are going to say in next Tuesday's S&D report. For corn 09/10 ending stocks are forecast to decline from 1.764 to 1.748 billion bushels, soybean 09/10 ending stocks are also seen being reduced, from 245 to 219 million bushels. The average trade guess even sees 09/10 wheat stocks falling from 976 to 973 million bushels. It's a tallish, but not impossible, task for US wheat exports to match the current USDA target of 22.5 MMT, we shall see. Certainly the case for reducing soybean stocks is an easy one to make. US wheat missed out again in Egypt's tender announced yesterday. Australia wheat production finished at 22 MMT, according to ABARE. Some reports suggest that farmers there will plant less wheat for 2010/11, due to the current very depressed domestic prices. These have been accentuated by a sharply higher Australian dollar. Early calls for this afternoon's CBOT session: corn called 1 to 2 lower; soybeans called 1 to 3 higher; wheat called 2 to 4 lower. Not content with winning just about every international tender going, the Russians have decided that they've got so much wheat that they are going to start giving it away. They've decide to donate 100,000 MT of their state-owned surplus to Cuba, a Foreign Ministry official said on Thursday. The first consignment of 25,000 MT will be shipped shortly, the diplomat told the official RIA-Novosti news agency. Unless Kazakhstan come in with a better offer I assume. McDonald's say that UK annual sales rose by 11 per cent last year, beating the burger chain's global average growth of 3.8 per cent almost threefold. McDonald's UK chief executive told The Scotsman newspaper that "It's a real strong set of results, and it's the strongest year in what's been a four-year run now. We have seen the business add £465 million (in like-for-like sales]." European average sales growth came in at 5.2 per cent, the Middle-East, Asia and Africa at 3.4 per cent, whilst growth in the US was the weakest at 2.6 per cent. The notion that growth has been aided by cash-strapped Brits choosing to go for a happy meal rather than dine out somewhere more salubrious is a misconception, he says. "I'm not concerned about the fading of the recession. It has been a popular myth that we have benefited from the recession," he is quoted as saying. Personally I think they have a solid business plan: spotty, ill-mannered, semi-retarded youths serving cheap food to other spotty, ill-mannered, semi-retarded youths. You don't even need to speak, what's the point of risking it, just point and grunt. Just a day after it was revealed that the hapless chumps at Defra are currently blowing nearly GBP5 million/year on empty office space, the RPA have announced that they are to close the Newcastle office which processes the single farm payment scheme applications. Thirty one staff will lose their jobs on the back of the move, hopefully they will pick up their cheques before they go rather than wait for them to be posted. Reports that next year's SFPS applications will be fast-tracked by a three-toed sloth called Arthur remain unconfirmed. The pound has dipped just below 1.57 against the dollar this morning, that's the first time it's been that low since May last year, when it was still on the road to recovery from the dark days of early 2009 when it fell to 1.35. It seems to be all about a flight to safety at the moment, and the dollar is still seen as the safest haven around. It seems strange that the dollar moves higher despite disappointing jobs data from the US, but there we have it. The US Labor Dept said yesterday that initial claims for unemployment benefit in the US increased by 8,000 to 480,000 last week, that's the highest figure for seven weeks. A fall of 10,000 had been expected. Crude oil stocks data also appeared to indicate that the global malaise is far from over. US refineries are now running at their lowest capacity since 1990, barring hurricanes, and crude stocks are still rising. Then we have the poor old euro and the spectre of the PIGS, the potential fallout from which is also weighing on the pound. The ECB left interest rates unchanged yesterday, as did the BoE, just as everybody expected. Trichet trotted out the same old rhetoric in his accompanying speech, droning on and on about how each country in the Euro Zone must sort it's own problems out. Blah, blah, blah. Greek customs officials began a 48 hour strike yesterday, doctors and civil servants plan to walk out next week and there is talk of a general strike later this month. As far as a Greek bailout is concerned the official ECB line is that there won't be one, as mounting one sets a dangerous precedent with the rest of the PIGS holding out their trotters. Why should other EU countries pay for their financial mismanagement? The domino effect could spell the downfall of the entire single currency. That puts Trichet in a be damned if you do, or be damned if you don't kind of a situation. The euro has consequently fallen from 1.5140 to 1.3640 against the dollar in just two months, a decline of 10%, further declines look on the cards. March soybean futures closed at USD9.14, up 6 cents, March soymeal futures at USD271.20, up USD2.30, and March soy oil futures at 37.21, up 0.31 points. The USDA reported weekly soybean sales of only 381,500 MT for delivery in 2009/10 - a marketing-year low. Whilst the soybean sales were disappointing, they don't need to be large to meet current USDA targets. March corn futures closed at USD3.54, up 1 cent, and May corn futures at USD3.65 ¼, up ¾ cent. The USDA said that weekly corn sales came in as expected at 923,200 MT for delivery in 2009/10 plus a small 3,000 MT sale for next season's crop. That compares with pre-report estimates for sales of 750,000 to 1,000,000 MT. March CBOT wheat futures finished the day at USD4.75 ¾, up 6 ¾ cents, March KCBT wheat futures at USD4.88 ½, up 5 ¼ cents, and March MGEX wheat futures at USD5.01 ¾, up 3 cents. The USDA confirmed weekly export sales iin line with estimates of between 350,000 to 550,000 MT at 418,200 MT for delivery in 2009/10, plus a further 64,500 MT for delivery in 2010/11. Japan purchased 85,000 MT of mostly US wheat in it's usual routine Thursday tender. London feed wheat closed Thursday with March GBP0.35 higher at GBP98.85/tonne, and Paris March wheat ends EUR0.25 higher at EUR125.50/tonne. It was a relatively uninspiring day, but farmers remain reluctant to sell at these levels, that is about the only thing left in their armoury that they have. It seems that UK futures below GBP100/tonne and French levels sub EUR125/tonne trigger some kind of mental block, growers generally simply will not sell at these levels. Maybe that isn't a bad thing, prices have come down a fair bit from where they were a few months ago, and there will be some shorts trying to nudge the market lower to make a few bucks. Egypt bought 240,000 MT of wheat in a tender today, of which 120,000 MT was Russian, 60,000 MT Kazakh and 60,000 MT French origin. It seems that maybe we have reached a floor in the market for the time being. The overnight grains closed higher with beans up around 5 cents, wheat 3-4 cents higher and corn 2-3 cents firmer. The dollar is a little firmer and crude oil is down around half a dollar. Data released yesterday showed that crude stocks rose in the US last week, despite US refineries running at less than 78% capacity, the lowest utilisation in a hurricane-free period since 1990. Given that temperatures in the US have been very cold this past few weeks, what does that tell us about demand? The USDA's weekly export sales report was below expectations for soybeans, but in line with ideas for wheat and corn. Corn gets a shot in the arm from news that the Environmental Protection Agency has been leaned on, and suddenly decided to re-analyse the way it ascertains whether corn ethanol beats gasoline’s carbon emissions by 20%. It's now decided that it does, which means that corn ethanol now has the door open to potentially exceed the current 15 billion gallon limit. South American corn and soybean crops are getting bigger, say Informa, much bigger. Iraq bought "at least" 700,000 MT of wheat yesterday say the newswires. An estimated 300,000 MT of that came from Canada, with the US getting 100,000 MT away themselves. The remainder may have consisted of Russian, Australian and German wheat it seems, although exact details are a little sketchy. Agri-food Canada peg the upcoming 2010 Canadian wheat crop at 24.7 MMT, down 6.8% on last year, mainly due to a sharp decrease in durum acreage. Japan purchased 85,000 MT of mostly US wheat in it's usual routine Thursday tender. Egypt are also out shopping again too, they won't find any shortage of willing suitors. Russia and Kazakhstan look the favourites once again. Early calls for this afternoon's CBOT session: corn called 1 to 2 higher; soybeans called 2 to 5 higher; wheat called 1 to 3 higher. Given the strength being displayed by the dollar this afternoon, I will be surprised to see things close in positive territory myself. Corn sales came in as expected at 923,200 MT for delivery in 2009/10 plus a small 3,000 MT sale for next season's crop. That compares with pre-report estimates for sales of 750,000 to 1,000,000 MT. Wheat sales also came in in line with estimates of between 350,000 to 550,000 MT at 418,200 MT for delivery in 2009/10, plus a further 64,500 MT for delivery in 2010/11. On the actual export front 1,275,000 MT of soybeans were shipped out during the week, with China (865,500 MT) the main destination. Corn shipments were 1,123,000 MT and wheat exports 449,500 MT. Whilst the soybean sales were disappointing, they don't need to be large to meet current USDA targets. Wheat sales continue to show signs of improvement, although they certainly need to. Based on current export levels the USDA's 2009/10 MY target of 22.5 MMT may be a little ambitious. As was widely expected the Bank of England announced at noon that they were leaving UK interest rates on hold at the all-time historic low of 0.5%. There were no changes announced to the GBP200 billion asset purchase programme either. That's money well spent isn't it? Two hundred billion quid to generate growth of 0.1% in the last quarter. How much would it cost to get something a bit more tangible? Sterling pushed higher against the dollar and euro immediately following the news. The ECB are next up with their announcement at 13.45 GMT. As has been the trend recently, it will be the exact wording of accompanying statements that the forex markets will react to. A lamb with two heads, five legs and two tails has been born in Somerset, according to the Daily Telegraph (here). Shame it died, it would have fitted in pretty well with the rest of the population down there. "She only told me she was my sister afterwards, officer." Which reminds me, what do you call a pig with three eyes? A Piiig of course. I don't know how I think them up I really don't. Ozzie chart toppers Men at Work have lost a plagiarism case which said that they had brazenly stolen the flute riff in their worldwide smash hit Down Under from the 1930's ditty "Kookaburra Sits in the Old Gum Tree". Plagiarists, don't you just hate them? Newly promoted into the global grain export Premier League, Kazakhstan has one major problem, it is land-locked. The Black Sea is around 1,500 kilometres away. So what do you do when you have a record 20 MMT grain crop and no ports to ship it from? 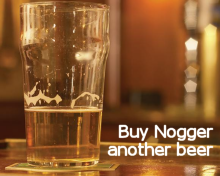 That's right, you buy one. Plans are afoot to buy a port on the Black Sea from new mates Georgia. The latter has already offered to let Kazakhstan use it's rail network to help get it's wheat to hungry buyers like Egypt. The ambitious Kazakhs are already in talks with China to build a grain terminal on it's border with China to open up access to the Far East and South East Asia. Now they are looking at the Georgian port of Poti to open up a gateway into North Africa and Europe. A deal was recently done to supply Egypt with 1.5 MMT of it's wheat requirements in 2010, and Kazakh president Nursultan Nazarbayev says his country has the capability to double agricultural output by 2014 by embracing new equipment and technology. Labour is one area where the country has big advantages over the west, the average salary in the agricultural sector in Kazakhstan is around just GBP1,500 per annum. Still, the women aren't much to look at. Imagine Arthur Mullard in a dress with some lipstick on. That's Miss Kazakhstan that is. I particularly like the "he’s never run anything other than a bath in his life" quote. News coming from the US Environmental Protection Agency appears to potentially open the door for large-scale increases in corn ethanol production in the US. Only two months ago the EPA frustrated US farmers and the ethanol industry bully boys by refusing to bow to pressure and increase the maximum inclusion rate of ethanol in gasoline from 10% to 15%. The EPA said it needed more time to assess the effect of an increase on the environment. In 2007 the Bush administration passed a law calling for annual biofuel production in the US to reach 36 billion gallons of biofuels, to be blended into the US gasoline supply, by 2022. An emissions reduction that they said would be like taking 27 million cars off the road. The law currently allows the production of up to 15 billion gallons per year, which the industry is already close to reaching. 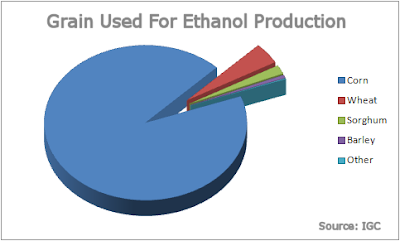 Ethanol production from corn beyond that would have to be subject to a requirement that its "lifecycle" - from growing the corn to producing the biofuel - reduces greenhouse gas emissions at least 20 percent more than the production of gasoline. The EPA are now saying that they've had a bit of a rethink and lo and behold it does. They will now be under strong pressure to relent on the so-called E15 blend too. If you've GOT to produce 36 billion gallons, then you've GOT to up the inclusion rate right? That potentially leaves US ethanol producers free to ramp up production, which will require them taking an even larger share of US farmers' corn production than the one third of the 334 MMT currently being grown there that they now use. That's good news for US corn farmers, although it potentially opens up a whole new can of worms elsewhere. Like what are the environmental implications of two thirds of all the corn grown in the US being used to produce biofuels? 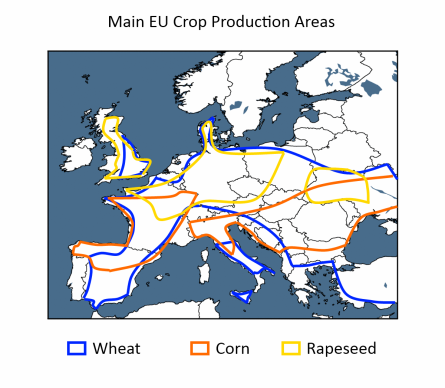 What are the knock on effects for the production of other crops there? And if most of the corn grown in the US goes for industrial use, driving global prices higher (they currently produce over 40% of the world's corn), then who's to say that Brazil won't be tempted to steal a few more million acres of rain forest to grow corn on? Crude oil skidded lower yesterday after the US Energy Dept said that stockpiles there rose by 2.32 million barrels to 329 million last week. A day earlier the American Petroleum Institute indicated that crude oil stocks had risen by 4.7 million barrels. What is perhaps more alarming than that is news from the Energy Dept that these rises came in the depths of winter when US refineries were running at just 77.7% of capacity. That's the lowest rate in at least the last twenty one years apart from in the aftermath of severe hurricanes like Ike and Katrina. Front month WTI crude currently stands at USD76.66/barrel this morning. The BoE is widely expected to leave their benchmark rate unchanged at their policy meeting today. More attention will be on QE, having blown the GBP200 billion asset purchase program already, will the MPC members officially bring an end to their quantitative easing efforts? Surely they aren't going to increase QE are they? The news is out at noon. Meanwhile the ECB are out at 13.45 GMT with their announcement on rates, closely followed by a Trichet press conference. Nobody expects anything other than interest there to be left on hold either. But will they do anything about Greece? Informa Economics upped it's estimates for Brazilian and Argentinean corn and soybean output yesterday. Beans came in at 1.5 MMT and 1 MMT respectively above the current USDA estimates. Corn came in at 2.3 MMT and 3.2 MMT respectively higher than Washington. In the USDA's weekly export sales report due at 13.30 GMT, soybean sales estimates range from 650,000 to 800,000 MT; corn estimates range from 750,000 to 1,000,000 MT; wheat estimates range between 350,000 to 550,000 MT. Romania's Ag Ministry says that good snow coverage of winter crops has led it to forecast yields of 3.3 MT/ha this season. That will give the country an expected wheat crop of 7 MMT in 2010, up by more than a third from 5.2 MMT in 2009. Agri-food Canada peg the upcoming 2010 Canadian wheat crop at 24.7 MMT, down 6.8% on last year, mainly due to a sharp decrease in durum acreage. Slightly lower yields are also being forecast. That's a little higher than the 24 MMT unofficially indicated recently by the CWB. Barley production is seen around unchanged at 9.45 MMT, and rapeseed output is forecast at 11.3 MMT, down 4.5%. March soybean futures closed at USD9.08, down 17 ½ cents, March soymeal futures ended at USD268.90, down USD4.70, and March soy oil futures at 36.90, down 57 points. Beans gave up all of Tuesday's gain and then some, apparently proving that yesterday was merely a temporary blip in a prolonged downwards cycle. Informa pegged the Brazil soy crop at 66.5 MMT and Argentina at 54.0 MMT. That's 1.5 MMT and 1 MMT respectively above the current USDA estimates. Estimates for tomorrow's weekly USDA export sales report range from 650,000 to 800,000 MT. March corn futures closed at USD3.53, down 12 cents, and May corn futures at USD3.64 ½, down 11 ¾ cents. Corn also reversed all of yesterday's gains and then some. Adding to the downward pressure were the Informa numbers for South American corn production. Informa is now forecasting Argentine corn production at 18.2 MMT and Brazil at 53.3 MMT. The Argentine number is 3.2 MMT above the USDA, and the Brazilian figure 2.3 MMT higher than what Washington currently estimate. Heavy rains and high temperatures have created "greenhouse" conditions in South America, sharply boosting crop production this season it would seem. Estimates for tomorrow's weekly export sales report range from 750,000 to 1,000,000 MT. March CBOT wheat futures closed at USD4.69, down 18 ¼ cents, March KCBT wheat futures at USD4.83 ¼, down 15 ¾ cents, and March MGEX wheat futures at USD4.98 ¾, down 13 ½ cents. Again all these closes reversed yesterday's gains and more. All eyes tomorrow will be on the USDA's weekly export sales report. Sales have suddenly put on a bit of a spurt the past couple of weeks, having been sadly lagging up until now. Weekly export sales for tomorrow are expected to range between 350,000 to 550,000 MT. The level of actual shipments is also important, with a weekly volume of 500,000 MT needed to match the current USDA target. London had been GBP1.00/tonne higher in early trade, but gave up virtually all those gains by the close. US wheat finished at it's lowest levels since early October on farmer selling, prompted by ideas that corn sales will soon pick up as warmer spring weather enters the Midwest. Egypt is back in the market tendering for wheat again this week, although nobody is getting very excited about that outside of Russia or Kazakhstan. French wheat is struggling to compete, particularly in view of the recently rigorously enforced maximum one port of loading regulations. Iraq is said to have bought at least 700,000 MT of mixed origin wheat, taking advantage of the recent break lower in prices. None of that tonnage is thought to have been EU wheat however. 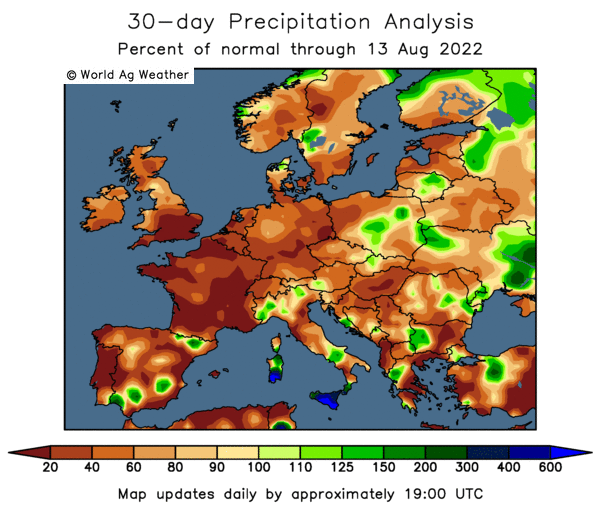 A wetter than normal January across Spain and Eastern Europe is thought to have beneficial to winter wheat prospects in those areas. Ukraine too saw precipitation of 1 1/2 to 2 times normal during the first month of the year. Recent snows have covered the wheat crop across the Ukraine. Temperatures took a large dip to much below normal in late January but have since warmed up, say QT Weather. "A recent study with growing and finishing pigs concluded that field peas could replace all of the soybean meal in diets fed to growing and finishing pigs without negatively influencing pig performance, carcass composition, carcass quality, or pork palatability." Next week on Nogger's Blog: Billy Bean's At My Door, The Tide is Rye and Club Triticale. The overnight grains closed narrowly mixed, despite having been in positive territory for most of the morning. Beans closed flat to a cent firmer, corn down 1-2 cents and wheat down fractions of a cent. Neither crude oil, the US dollar or the stock markets are doing anything too exciting either, all just showing small fluctuations either way. Whether last night's stronger close across the board was some sort of floor and really means anything, or is it simply a selling opportunity, only time will tell. There is very little change in any of the fundamentals that's for sure. Informa are out later today with their latest world production estimates, maybe they can throw some pearls our way? Beneficial thunderstorms are seen returning to Argentina's grain belt. A powerful storm is developing in the US Southern Plains, with more rain predicted for Texas-Oklahoma wheat, says Gail Martell of Martell Crop Projections. Jordan bought 100,000 MT of Black Sea wheat overnight, and Japan is looking for 85,000 MT of mostly US wheat tomorrow. Iraq might also be in the market, according to some reports. South Korea is looking for 55,000 MT of corn, and China is to sell around 200,000 MT of state-owned soybean reserves. Early calls for this afternoon's CBOT session: soybeans called flat; wheat and corn 1-2 cents lower. Biofuel Will Save The Wheat Market Won't It? 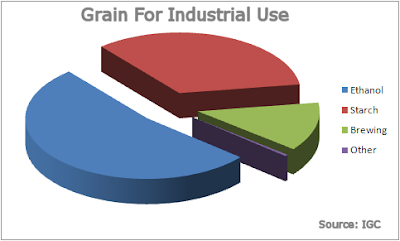 Figures from the IGC estimate that in 2009/10 global usage of grains for industrial purposes (excluding food, feed and seed) will reach a record 257 MMT. That sounds pretty bullish doesn't it? 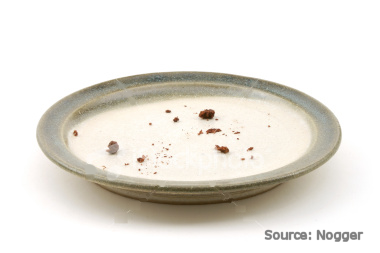 It represents 15% of disappearance of the global grain crop of 1.7 billion tonnes this year. But whilst that 257 MMT represents an increase in usage of 8% from the 239 MMT consumed in 2008/09, it is interesting to note that the rate of expansion in this sector is actually slowing quite significantly. Growth in the previous season, 2007/08, was 10% and the year before, 2006/07 we had seen an increase of 16% more grain consumed for industrial use. Grains used for biofuels in 2009-10 are forecast to total 124.9 MMT, again whilst that is an increase of 15% on 2008/09, the rate of growth is also not rising as fast as in previous years. In 2008/09 growth in the biofuel sector was 24% and the previous year it was 36%. China's National Grain and Oils Information Centre sees the country's appetite for soybeans continuing unabated in the first quarter of 2010. January and February imports are forecast at 4.2 MMT each per month, with a slight dip in March requirements to 3.8 MMT. That brings Q1 imports to 12.2 MMT, almost 20% higher than the 10.2 MMT shipped into the country in 2009. That would appear to get the nation on track to import a record amount of soybeans in 2010, beating the 42.55 MMT imported in 2009, according to the state-sponsored think-tank. That might sound bullish, but let's say they increase their requirements to a record 45 MMT this year, up 2.5 MMT from 2009. Output from lowly Paraguay alone is seen increasing by more than that this year. March soybean futures ended at USD9.25 ½, up 15 ¾ cents, March soymeal futures at USD273.60, up USD1.80, and March soy oil futures at 37.47, up 128 points. Prices were probably overdue a recovery from four month lows, although that doesn't mean that the downturn has ended. The soybean harvest is around 5% done in Brazil, more than double last season's pace, reflecting the large increase in early sown, fast maturing varieties planted for this season's harvest. March corn futures closed at USD3.65, up 6 cents, with May at USD3.76 ¼, up 6 cents. Sharply higher crude oil prices and the lower dollar helped values today. Whilst US farmers are less than keen to sell at current levels, reports circulate that they may have to once weather conditions improve. The theory is that millions of tonnes of wet corn will start to rapidly deteriorate once temperatures warm up, forcing US farmers' hands. March CBOT wheat futures closed the day at USD4.87 ¼, up 12 ½ cents, March KCBT wheat futures were at USD4.99, up 11 ½ cents, and March MGEX wheat futures at USD5.12 ¼, up 11 cents. As with other markets, things were overdue a corrective bounce. The USDA currently rate winter wheat crop conditions in Kansas, the largest HRW producing state, at 11% poor/very poor and 56% good/excellent. London feed wheat closed higher Tuesday with March ending up GBP0.90 at GBP98.40/tonne, and Paris March wheat closing up EUR0.50 at EUR126/tonne. It was another day of consolidation, March London wheat has fallen by almost GBP13/tonne since early January and March Paris wheat by EUR8.20/tonne. We have maybe been overdue a bit of a correction this past few days. European crops are largely looking in pretty good shape ahead of their emergence from winter dormancy. 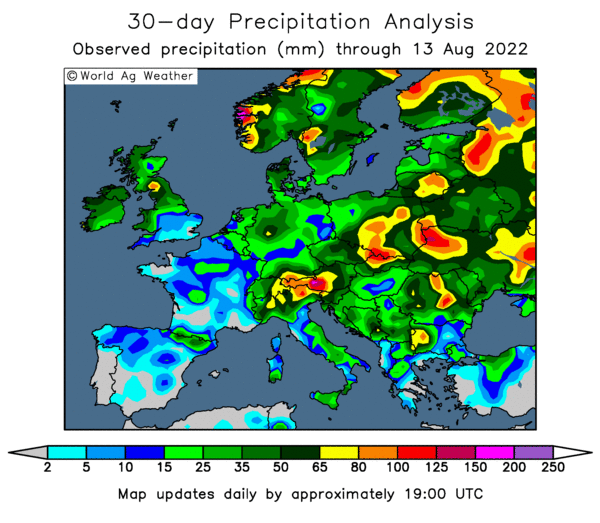 Some concerns remain however for winter wheat in Ukraine and parts of Russia. In Russia, the Tavropol and Krasnodar wheat areas were coaxed out of dormancy with exceptional warmth, mid December to mid January, with frequent days topping 50 F. This was followed by a bitter cold wave January 24-27 when night temperatures plummeted below zero F, say Martell Crop Projections. UkrAgroConsult say that Ukraine winter crops were "in their worst condition in the past four years", after dry autumn planting conditions. "Spring fertilization of crops will be critical," they add, according to Agrimoney.com. Will they have any money to afford to buy spring fertilizers is the question. Probably not is the answer. Don't go getting me wrong, I'm not turning into Jake La Motta here, but I maybe feel that prices have possibly fallen enough for the time being. Certainly farmers don't want to sell at current levels. Buyers don't want to buy on a declining market either, but shorts WILL have to buy, and there are probably plenty of those around at the moment. The overnight grains closed firmer, with beans 4-5 cents higher, corn up 3-4 cents and wheat 9-10 cents higher. The dollar is off yesterday's highs a little and crude oil is a tad firmer. There doesn't seem to have been any huge shift in fundamentals, and the trend remains lower across the grains complex, however it looks as if we may see a bit of a correction from recent steep losses today. The soybean harvest is around 5% done in Brazil, more than double last season's pace, reflecting the large increase in early sown, fast maturing varieties planted for this season's harvest. There are already reports of logistical problems in Mato Grosso. in the US HRW wheat states, the snowmelt from last week's winter storm will replenish topsoil moisture but it was still not enough to offset winter drought, says Gail Martell of Martell Crop Projections. Conditions have been extremely dry in southern Kansas, the northern Texas panhandle and northern Oklahoma. Barely half of normal moisture was received November-January, including the recent snow storm, says Gail. Japan are tendering for 85,000 MT of wheat this week, of which 65,000 MT is US origin. It will be interesting to see if weekly export sales for wheat can hold up for a third week in Thursday's USDA report. Weekly shipments need to average 500,000 MT/week for the remainder of the marketing year to reach the USDA's projected target. There are no such problems for soybean export inspections, which are currently at 67.8% of USDA projections, that is well above the 55.2% for the five year average. Sales now need to only average 14.3 million bushels/week (390,000 MT) for the remainder of the season. For US corn, quality remains a major issue, and one that might worsen when warmer weather finally arrives. Early calls for this afternoon's CBOT session: corn called 1 to 3 higher; soybeans called 3 to 5 higher; wheat called 7 to 10 higher. Feed, fuel and food distribution group NWF today report their half-yearly results for the period ended Nov 30th 2009. They reveal group revenue down 11.4% to GBP175.5 million, but profit before tax up 11% to GBP2 million. Food distribution revenue was flat at GBP20.6 million, but operating profit was up by 70% to a record GBP1.7 million on the back of "improved operating efficiencies and increased backload utilisation." Feed revenue fell 16.6% to GBP41.2 million, with operating profit down by almost two thirds to GBP0.5 million. Fuel revenue also fell, by 11.3% to GBP113.7 million, with operating profit down by almost half to GBP0.7 million. Shares in NWF Group were down 6.6% at 92 pence in early trade. 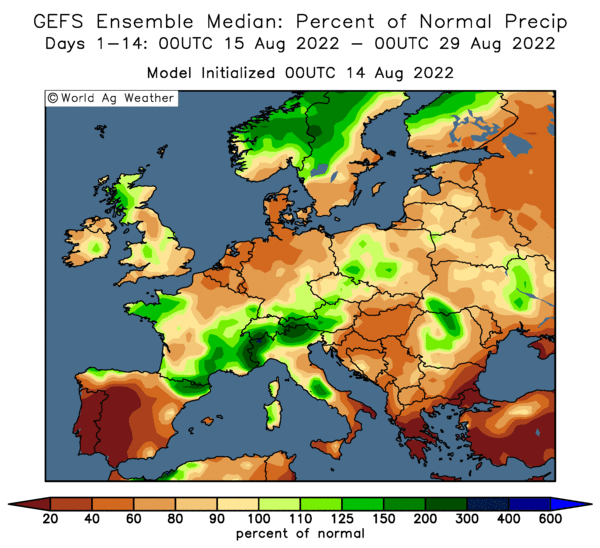 The latest precipitation map for Europe from the US Climate Prediction Centre shows a distinct "game of two halves" for the month of January. 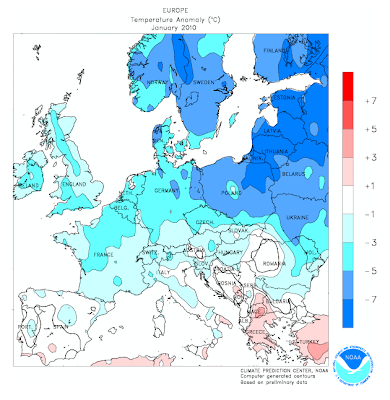 Whilst the UK, France, Germany and most of Scandinavia in the northern half of the region had generally lower than normal precipitation during January, things were a lot different in Spain, southern Italy and most of Eastern Europe. Now here is a surprise, the results of a Which? magazine survey into how UK customers rate their supermarket shopping experience. The scores combined overall satisfaction, price, product quality, customer service and store environment (tidiness, queues, trolleys etc). Top of the Shops, so to speak, was Waitrose with a satisfaction rating of 79%. The survey, I assume, didn't include docking of points for how bloody rude and surly your fellow customers are? Because the last time I was in Waitrose just a week or so ago it was clearly noticeable that there was a "Waitrose type", and it wasn't the sort of person that you exchange pleasantries with. Certainly food quality was high, just like food price, seven quid for six wafer-thin slices of rare roast beef as I recall. It won't surprise you to hear that M&S came in second with a score of 64%. Again my main problem with shopping at M&S is physically getting round the store. Seldom do you ever see so many zimmer frames and walking sticks in one place. Crikey, the average age of the punters in there must be 70+ surely. A woman in front of me the other week dropped dead right before my eyes immediately after she'd finished paying for her shopping in there. I felt really sorry for her as she'd just bought a bag for life. Still, I thought there's no point letting all that fresh stuff go to waste is there? The big surprise comes with Aldi and Lidl tying in 3rd slot with 61%. Blimey, there must be more of a market for Guatemalan Mars Bars than I thought. Online supermarket Ocado, who I have no experience of but have heard good reports about, scored highest in the home delivery ratings with a score of 80%. Interestingly the rarely mentioned bunny-boiling Mrs Nogger#2 used to be a home delivery driver for one of the "big four" who often had some interesting stories to tell. Especially in relation to people inadvertently mis-ordering stuff online. The order would come through to the store something like this: one small loaf, a pint of milk, a microwave tagliatelle for one, a tin of garden peas (small), a packet of digestive biscuits, four small cans of Guinness and FIVE KILO'S OF BANANAS. Clearly they wanted five bananas, but nobody with half a brain could be bothered to ring first to see if this person had a huge cage on chimpanzee's in their back garden, they just sent the bananas round anyway. Ukraine exported 1.78 MMT of grain in January, of which 680,000 MT was wheat, 400,000 MT barley and 700,000 MT corn. That brings exports for the marketing year to date to 15.4 MMT (incl 7.5 MMT of wheat, 4.1 MMT of barley and 3.5 MMT of corn). The January grain export figure is up 180,000 MT on 2009, and the year to date total is 800,000 MT higher than in 2008/09. Yet the official target for exports during the current marketing year is only 16-17 MMT. Either the official target is wildly out, or exports are going to slow to a trickle from hereon in. I suspect that the truth of the matter is that Ukraine only have 16-17 MMT to export to balance the supply/demand books, but in reality they will allow much more than that to leave the country to get some foreign reserves in. The Pakistan government have reduced their wheat production forecast for the 2010 crop from 25 MMT to 22.3 MMT, citing drought. There was no significant rain at all across the country in November and December 2009, say the Agriculture Ministry. However as only 10% of the nation's wheat is grown in non-irrigated areas, this will minimise output losses, they say. The majority of the country's wheat is grown in Punjab, where over 6.841 million hectares of wheat has been planted, say the Ministry. Official figures place government reserve stocks at 2.5 MMT, which will keep the need for imports down to a minimum this year, they add. But of course they would say that wouldn't they? Private estimates suggest that wheat production this year will be around 19-20 MMT, double the government's shortfall, and that government reserves may be nearer 1.5 MMT taking into account large-scale smuggling into neighbouring Afghanistan. Pakistan consumes around 23 MMT of wheat per annum. They also are said to have an imbalance in their rice production/consumption/export equation, which effectively means that they are exporting more rice than they have surplus in a desperate need to get some foreign reserves in. Meanwhile, the government there are said to be in negotiations with oil-rich Saudi Arabia to lease it an area of farmland twice the size of Hong Kong to grow wheat, fruit and vegetables. Saudi recently abandoned a drive to become self-sufficient in wheat, saying that the plan wasn't viable with the cost of irrigation and the country's inhospitable climate. Hull-based pork specialist Cranswick say that Q3 sales (to Dec 31st 2009) were up 31% to GBP200 million, although that includes the contribution from CCF Norfolk which was newly acquired in June 2009. Fresh pork sales were up 70% year-on-year and bacon sales up 61% whilst operating margin "was maintained at a level similar to that achieved in the first half of the year", it says. Talking of pork, are Talk Sport messing about when one phone-in pundit this morning says of John Terry: "leave him alone, he scored at the weekend, some of the papers are saying he should fall on his sword, but I don't agree." March soybean futures settled at USD9.09 ¾, down 4 1/4, March soymeal futures were at USD271.80, down USD2.00/tonne, and March soyoil futures at 36.19, up 4 points. A stronger US dollar was bearish, although a correction from recent sharp declines over the last fortnight was also in evidence. South American new crop supplies remain a threat, although China still continues to keep buying US beans for the time being. March corn futures settled at USD3.59, up 2 1/2 cents, May corn futures settled at USD3.70 ¼, up 2 1/2 cents. As with beans today's action was likely to be more to do with a correction from recent losses, than any fundamental change in market direction. Conditions in Argentina improved, with one-third of the corn belt received beneficial showers over the weekend and more is on the way Wednesday-Friday, say Martell Crop Projections. The Buenos Aires Grain Exchange now say that the country will produce 18.4 MMT of corn this season, 0.4 MMT more than last week's estimate and 3.4 MMT more than the USDA's latest guesstimate. March CBOT wheat futures settled at USD4.74 ¾, up ¾ cent, March KCBT wheat futures were at USD4.87 1/2, up 1/2 cent, and March MGEX wheat futures at USD5.00 ¾, down 7 3/4 cents. Texas and Oklahoma wheat farms got 10 inches of snow in a major storm last week. Southern Kansas got 4-6 inches. The snow is much appreciated, not only for the .5-1.25 inches of moisture it contains, but also to protect wheat from wind damage. West Texas wheat has sustained serious damage from blustery winter conditions. Only 31% of Texas wheat was rated good in late January while 21% was considered poor-very poor, say Martell Crop Projections. London wheat managed to post a rare higher close Monday with March ending up GBP0.45 at GBP97.50/tonne, and Paris March wheat closing unchanged at EUR125.50/tonne. That was only London's fourth higher close so far this year out of 25 sessions, not a very impressive record for a contract that began the year at GBP109.20/tonne. The pound dipping below 1.59 against the US dollar for only the second time this year helped UK prices nudge higher from the start. Apart from that, and a modest correction from the recent downturn, there was very little to get excited about. Prices are stuck in a rut, and that rut points downwards. 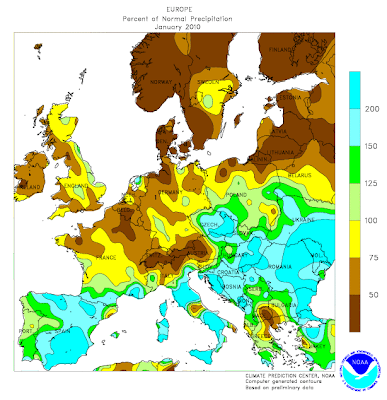 Like it or not, winter wheat plantings are done, and across Europe at least they are up. A bit of extra demand from the odd bioethanol plant here and there is not going to take up the increased carryover and extra production anticipated in 2010. Now 1.2 MMT (the projected requirement of a little plant on Teesside that you might have heard of) might sound like more than "a bit" - but at the end of the day it is "only" 8% of the UK production in 2009. We are now more than halfway through the 2009/10 marketing year, and the facility concerned hasn't really consumed anything yet in wheat terms. So that knocks that down to a utilisation of less than 4% of last year's wheat crop - and that is if it were to run on full capacity from day one. Knock off some more for the fact that it clearly won't, and this big new consumer that the UK wheat trade is hoping to be it's salvation will maybe only mop up 2%, at the most 3%, of the UK's 2009 crop. That hardly seems like a life saver to me. It was a busy week for traders offering barley into the UK intervention scheme last week, certainly the most active week since the programme opened at the beginning of November. The RPA report that 40,000 MT was offered last week, well up on 6,000 MT from the week before, as growers and dealers sought to take advantage of the January price which was fixed on the pound/euro rate of around 1.12 at the start of the year. With 1,680 MT of original offers rejected to date, cumulative net barley offers now stand at just over 62,000 MT. There's not a lot of change on the overnight grains so far this morning, with wheat up a tad and corn and beans slightly lower. Crude oil is also showing little change. The dollar continues to run higher following Friday's bullish economic data, currently at around 1.5935 against the pound and 1.39 against the euro. Argentina is in for a "very wet" week, say QT Weather, with 3 inch totals in many locations. That should allay any fears of losses to soybeans and corn that were just starting to emerge. Is nature annoyed with Pakistan? The first one touches on allegations reported here recently that India is "illegally stealing" water from Pakistan to irrigate it's own crops. Various reports suggest that Pakistani wheat production might fall to around 19-20 MMT this year, from 24 MMT in 2009. That's unlikely to be a "market mover" right now, as Pakistan has sufficient carryover stocks to at least cover it's domestic requirements for the remainder of 2010. It is worth keeping an eye on this situation though, particularly if a shortage of water also starts to affect wheat potential in neighbouring India, where wheat is at the heading stage.